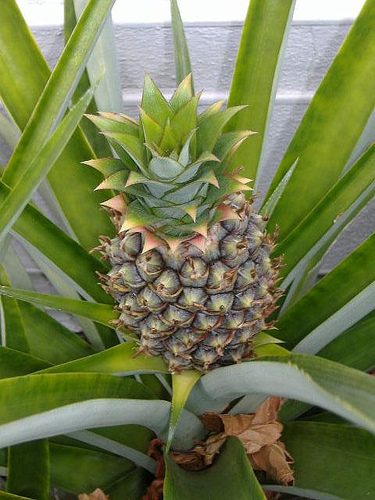 The pineapple (Ananas spp.) was originally consumed only as a fresh fruit. With the development of the processing industry, the fruit is now prepared and consumed in various forms such as pineapple chunks, slices, juices, syrups, jams, crushed pineapple, diced pineapple etc. also the wastes from processing the fruit are now further processed into sugar, wines, vinegar, animal feed, etc. 1. Peel the pineapple, remove eyes, core and wash.
3. Prepare the syrup, 2 parts sugar to 1 part water. 4. Boil the pineapple in the syrup for 20 minutes. 5. Soak in syrup overnight. 6. Strain and wash well in water. 7. Dry in solar drier for 16-20 hours. 9. Roll over sugar and wrap in cellophane. 10.Put in plastic bags; seal open end of bag with the flame of a candle. Processing pineapple into vinegar is a good way of turning overripe, blemished, or surplus fruits, discarded cores, peels and trimmings into money. Although not as popular as coconut vinegar, pineapple vinegar is already being exported in small quantities. Pineapple vinegar can be produced by alcohol and acetic acid fermentation. Alcohol fermentation. Wash the pulp of the ripe fruits. Mix well and one part mashed fruits with three parts of water. Press the mixture through a cheese cloth with double thickness. Add 1.5 kg of sugar for very 9liters of the diluted juice, and pasteurize it at 65oC for 20 minutes. Cool and transfer the mixture in a demijohn damahuwana0 or any suitable container. Add two tablespoon of Fleischmann’s yeast. Cover the container with the clean cheese cloth or loose cotton wad. Allow the solution of ferment from four to seven days until no more carbon dioxide bubbles form. Strain the liquid through the clean cheese cloth to remove the yeast and other solid materials. Pasteurize the alcoholic liquid at 65oC and allow it to cool. Acetic acid fermentation. To the alcoholic solution, add 2 liters of the mother vinegar or starter for every volume of the formulation indicated above. Mother vinegar may be obtained from the National Institute Of Science and Technology (NIST). Set it aside undisturbed for one month or until maximum sourness (acidity) is obtained. To develop desirable aroma and flavor, allow the vinegar to age the demijohn, barrels, or earthen jars filed to capacity. Filter the vinegar and pasteurize it to kill microorganisms before bottling the product. If clear vinegar is desired, add the well-beaten white of two eggs for every 10 liters of vinegar and stir it until the egg white coagulates. The clear vinegar is obtained by filtering. 1. To make pineapple juice, choose undamaged pineapples; peel and remove eyes. Wash and mash the fruit thoroughly. To hasten juice extraction, add a little water. Strain the juice through cheese cloth to remove pulp. Add sodium benzoate and citric acid equivalent to 0.5 per cent (0.5 g per 1) and 0.3 per cent (3 g per 1) respectively of the total volume of the juice. Add sugar if desired. 2. With constant stirring, heat juice to 80oC and maintain this temperature for about five minutes. Pour the juice in tin containers or glass jars while it is hot and seal immediately. Process in boiling water, bath for 15 minutes. Let the canned product cool. Lastly, wipe dry, label and store. 1. Wash ripe pineapple thoroughly. Cut off the ends and divide the fruit into small pieces. Pass it through a meat grinder or chop and mash it thoroughly. Extract the juice by pressing lightly with hand. The extract can be made into juice or vinegar. Add water equivalent to the pulp residue and mix them well. For every part of the mixture add one part sugar and 100 to 150 mL starter consisting of pure, young, vigorous culture of nata organisms in an appropriate substrate. This can be obtained from the National Institute of Science and Technology (NIST). 2. Place the mixture (one-third full) in clean wide-mouthed gallon glass jars. Cover the mixture with paper or cheese cloth and set it aside undisturbed for three weeks. 3. After three weeks, harvest the nata and wash it thoroughly. Cut into cubes or strips and soak in water for a day or two, changing the water every three of four hours. Boil the nata in several changes of fresh water until the vinegar-like odor and taste are removed. Cook it in syrup (2 parts sugar to 1 part water) for 30 minutes. Use 1 part sugar used in preparing syrup for every part of nata. Soak it in syrup overnight. Flavor it with cubed fresh pineapple or canned pineapple juice. Then, boil for another 30 minutes or until the nata cubes are translucent. 4. Put the hot nata in clean jars or tin cans. Seal it immediately and process it in boiling water for 30 to 45 minutes depending upon the size of the container. Cool the product, wipe dry, label and then store. 5. Begin by peeling the firm ripe fruit and removing eyes and core. Slice, dice, crush, or cut pineapple into desired size and shape. Boil the fruit in syrup (one part sugar, one part water). Then put in clean tin cans or glass jars. Cover with enough syrup and seal the containers. Let the canned product cool. Wipe dry, label and store. 1. Peel ripe pineapple and remove the eyes. Wash and chop finely or mash the whole fruit and mix well with refined sugar (1 part fruit and 3/4 to 1 part sugar). If the mixture is too sweet, add calamansi juice as desired. Then cook gently with constant stirring until thick. 2. Pack the mixture in clean glass jars while it is hot and seal tightly. Process in boiling water, bath for 15 minutes. Cool, wipe dry, label and store.